Grease square pan, 8x8x2 inches, with butter. Mix sugar and cornstarch in 2-quart saucepan. Stir in corn syrup, water, butter and salt. Heat to boiling over medium heat, stirring constantly. Cook, without stirring, to 265°F on candy thermometer or until small amount of mixture dropped into cup of very cold water forms a hard ball that holds its shape but is pliable; remove from heat. Stir in vanilla. Pour into pan. When taffy is just cool enough to handle, pull it with lightly buttered hands until satiny, light in color and stiff. Pull into long strips 1/2 inch wide. Cut strips into 1 1/2-inch pieces, using scissors. (For easier cutting, wipe scissors with vegetable oil.) 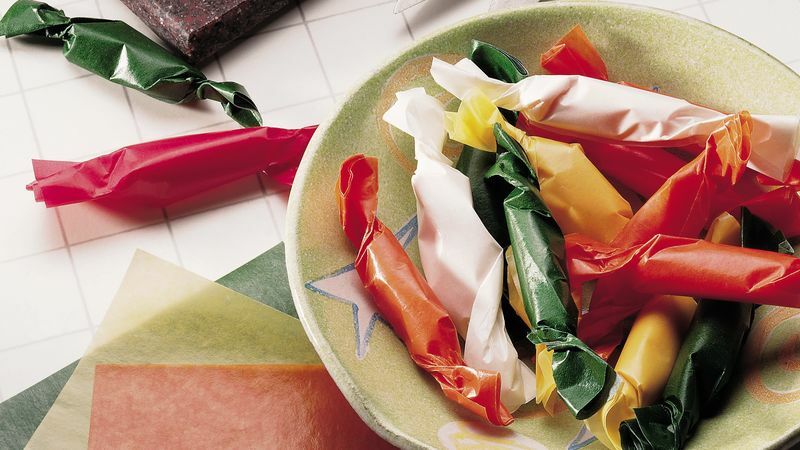 Wrap pieces individually in plastic wrap or waxed paper (candy must be wrapped to hold its shape). Create new flavors by adding 2 teaspoons almond or rum extract with the vanilla or by adding 1 tablespoon peppermint extract and omitting the vanilla. Create colored taffy by using 1/4 teaspoon liquid food color for each batch.